In the crowded compact car segment, the Mazda3 is focused on customers who enjoy driving. Competing with the Toyota Corolla, Honda Civic, Ford Focus, and Chevrolet Cruze, the Mazda3 offers value and premium technology not available in most of its competitors. 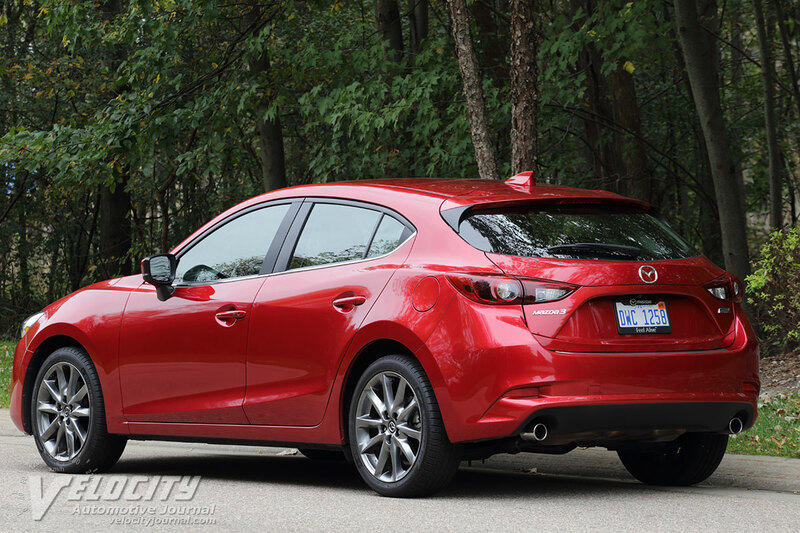 Mazda sells both 4-door sedan and hatchback variants of the Mazda3. The base model is the Sport, followed by the Touring, and Grand Touring models. Pricing starts at $18,095 (4-dr. 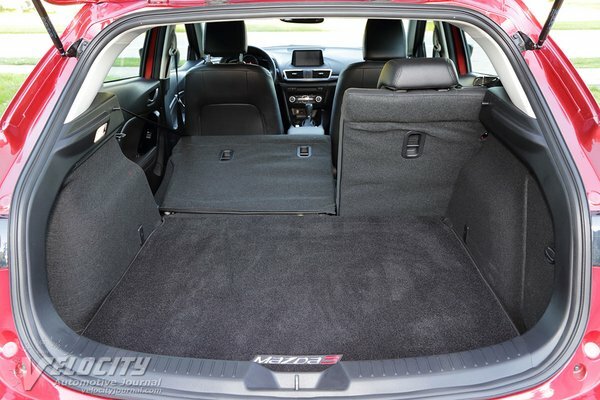 Sport MT) and ranging up to $24,945 (5-dr. Grand Touring AT). 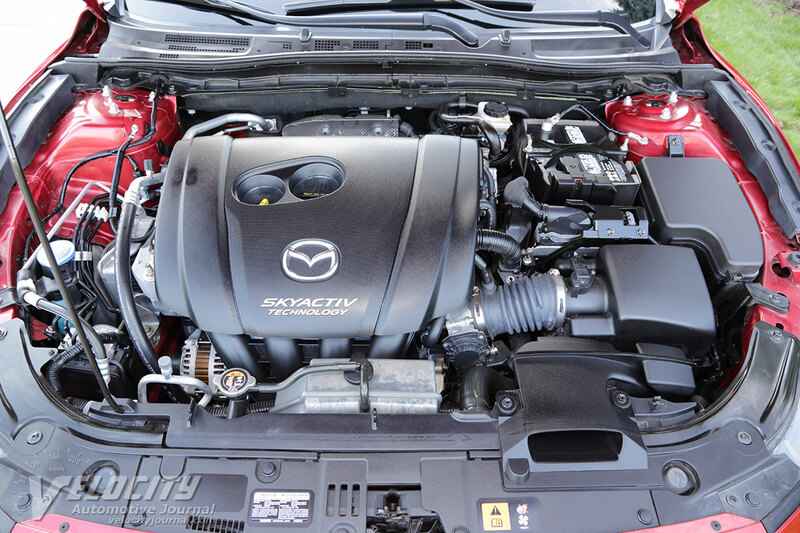 Engines include a 2.0L and 2.5L inline-4. A 6-speed manual or optional 6-speed automatic is available in all models. 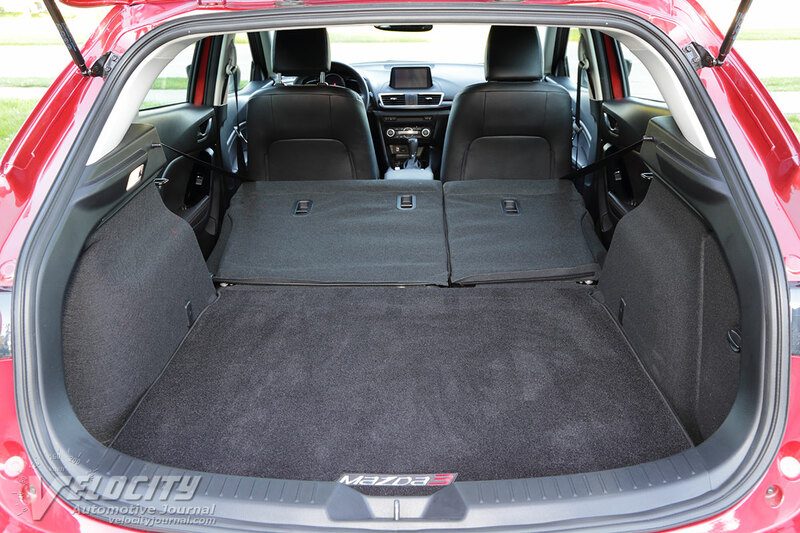 We tested a 5-dr. Grand Touring AT model with options including cargo mat ($75), soul red metallic paint ($300), rear bumper guard ($100), scuff plate/door sill trim plates (($125), and the Premium Equipment Package ($1,600). The total including the $890 destination charge added up to $28,035. Among the comprehensive equipment in the Grand Touring are satellite navigation via a 7-inch touchscreen, heated leather front seats & steering wheel, 18-inch diameter alloy wheels, adaptive bi-LED headlights, LED foglights, adaptive front lighting, moonroof, and a Bose audio system. Safety technology includes a rearview camera, blind spot monitoring, lane departure warning, lane keep assist, rear cross-traffic alert. 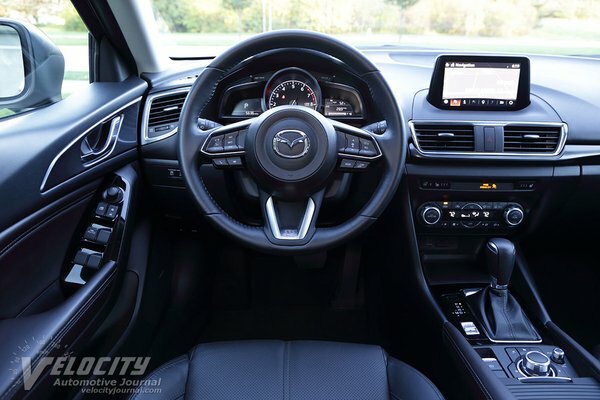 Mazda designed the interior with premium materials throughout. 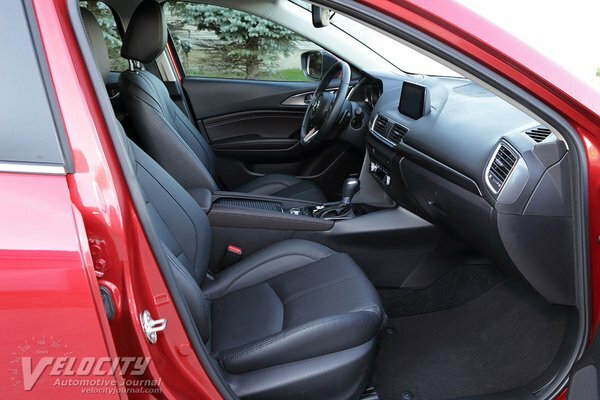 Examples include the matte aluminum spanning the dashboard, aluminum-rimmed control knobs, vent bezels and door handles. Glossy piano black door and center console panels contrast with the aluminum details. 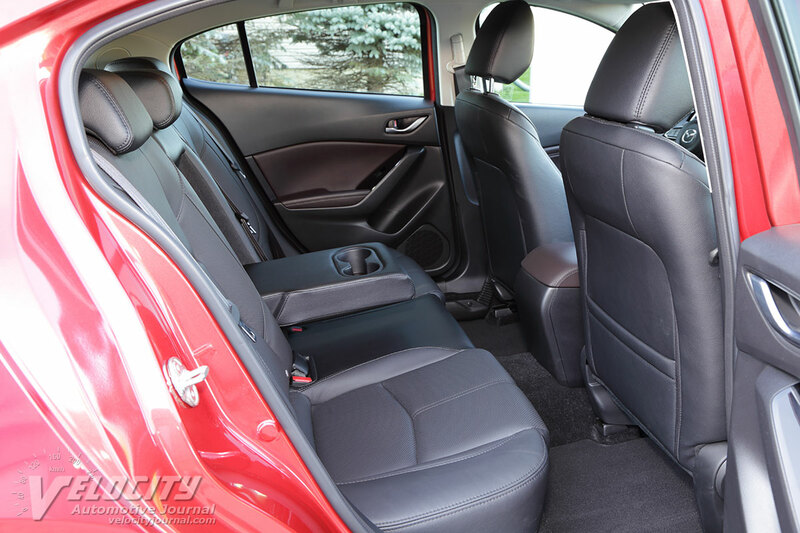 The heavily bolstered front seats are upholstered in black perforated leather. Seat heater buttons are readily accessible on the center stack above the climate controls. The 7-in. 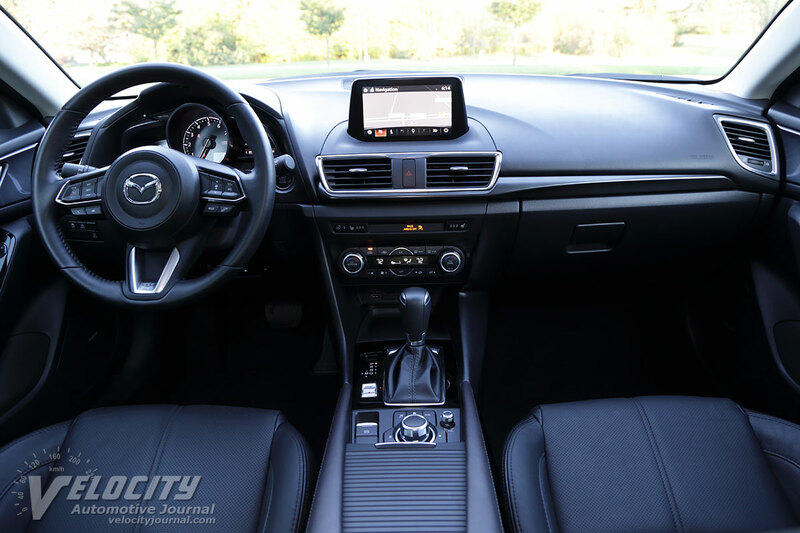 touchscreen display atop the dash shows audio data and navigation maps. The touchscreen is disabled when driving, so we used the multi-function knob on the center console to adjust infotainment system settings. Adjacent is a smaller audio volume knob. The sculpted leather-wrapped steering wheel includes audio, mobile phone, and cruise control buttons. A center-mounted analog tachometer includes a digital speedometer. A retractable head-up display on the dash shows vehicle speed and navigation directions. Flanking the tachometer is the trip computer display showing fuel consumption and other vehicle data. A coolant gauge is conspicuously missing; a blue light indicates cold coolant. After the engine warms up, the coolant light turns off. As in the norm for most compact front-drive cars, the Mazda3 uses a MacPherson strut front and multilink rear suspension with coil springs and dampers. Stabilizer bars are at both ends. The braking system consists of vented 11.61 in. diameter front discs and 10.43 in. diameter solid rear discs with power assist. ABS, traction control and Dynamic Stability Control are included. Dunlop 215/45R18 SP5000 all-season tires mounted on 18-inch diameter alloy wheels are standard. 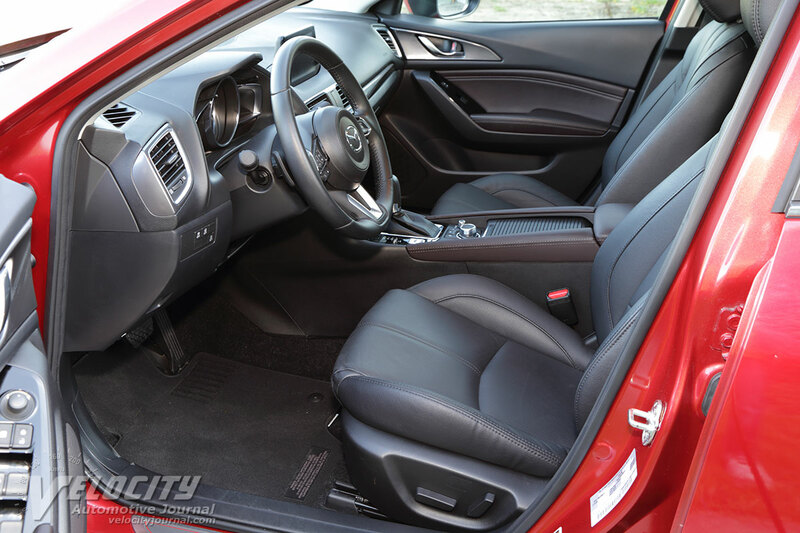 The rack-and-pinion system is electrically-assisted with 2.57 turns lock-to-lock. Curb weight ranges from 2,899 lbs. (Sport MT) to 3,098 lbs. (Grand Touring AT). 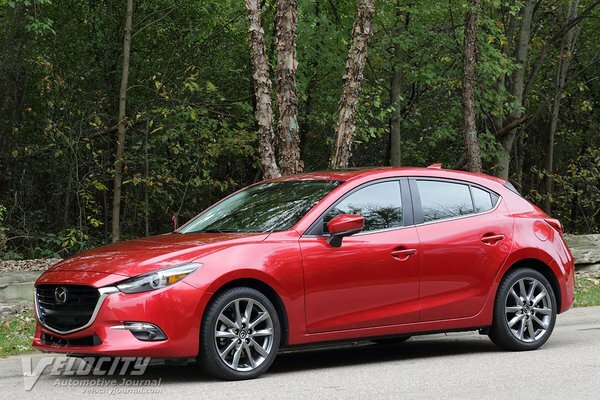 Both engine options are all-aluminum inline fours with direct-injection, dual overhead cams and variable valve-timing. Only the Sport is powered by the 155-hp 2.0L; Touring and Grand Touring get the 2.5L under the hood. Rated at 184-bhp @ 5,700 RPM and 185 lb.-ft. @ 3,250 RPM, the 2.5L Skyactiv-G engine's output is similar to other powerplants in its class. Redline is a fairly conservative 6,500 RPM. The 6-speed automatic has overdrive ratios for both fifth (0.708:1) and sixth (0.599:1), coupled to a 3.389:1 axle ratio. Estimated fuel consumption is 26/35 MPG (city/hwy.). 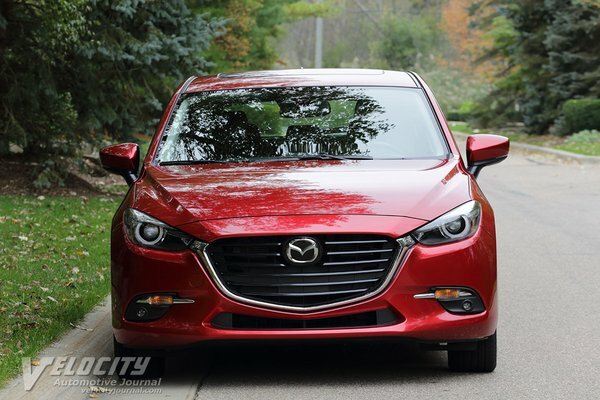 We averaged 26 MPG in mixed urban and highway driving. Top speed for all models is limited to 130 MPH. Many enthusiasts find that comfortable, supportive seats are often missing from many affordable compact cars. Mazda understands this, so the front seats are designed for excellent support and bolstering, although the seat cushion is somewhat hard and flat. 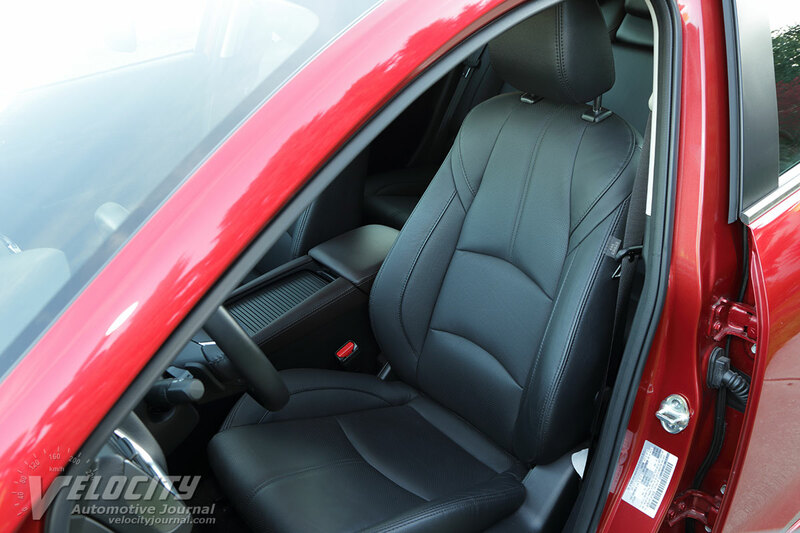 The driver benefits from 6-way power seats and manual lumbar adjustment, but the passenger seat only has 4-way manual controls. 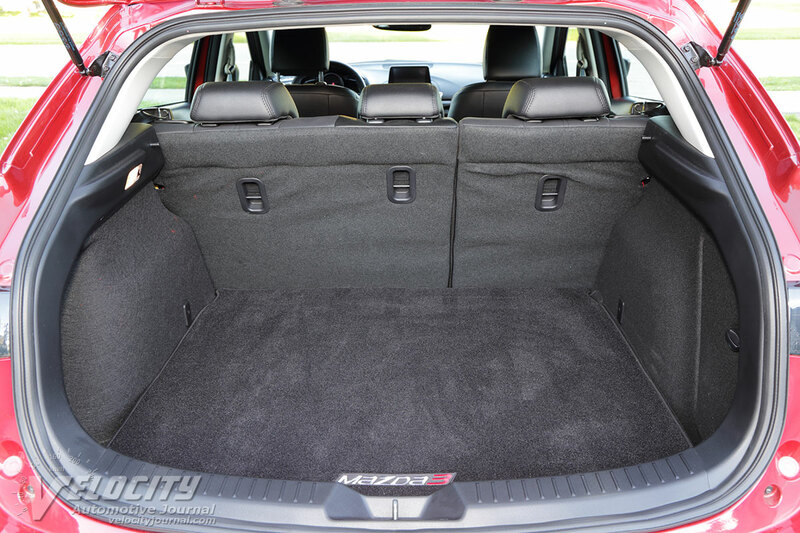 Front headroom is adequate for a sub-6 ft. driver. 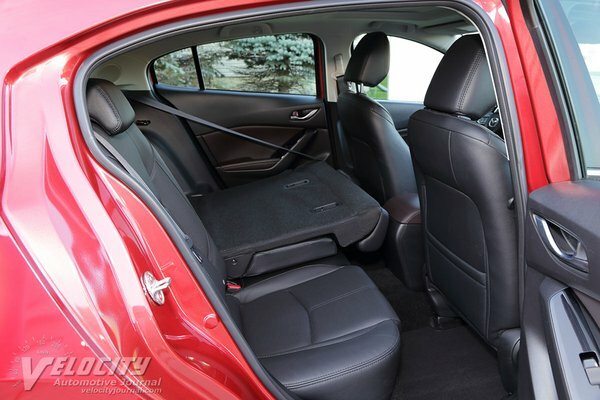 Rear seat passengers are rewarded with comfortable accommodations; the sculpted cushions provide above average support for the outboard occupants. Legroom and headroom are adequate assuming occupants are less than 6 ft. tall. The center seating position is only tolerable for short trips. 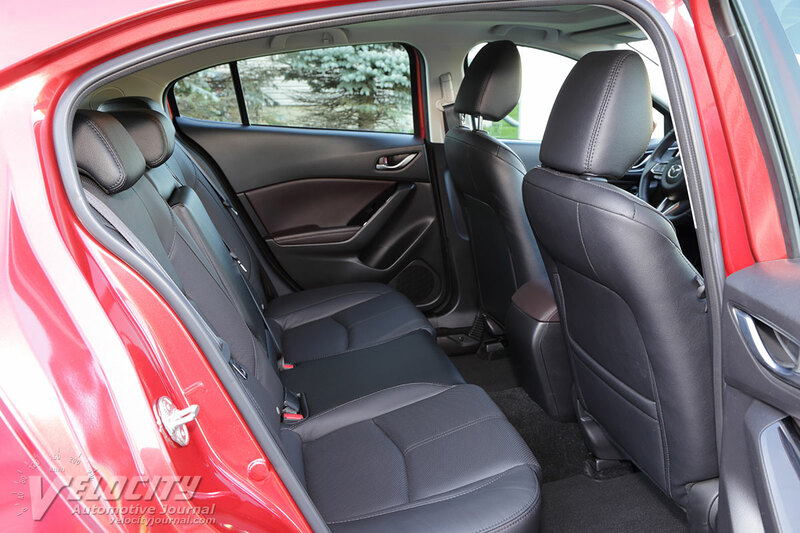 A high rear beltline and small rear side windows restrict outward vision for passengers. Considering the nearly 200 lbs. 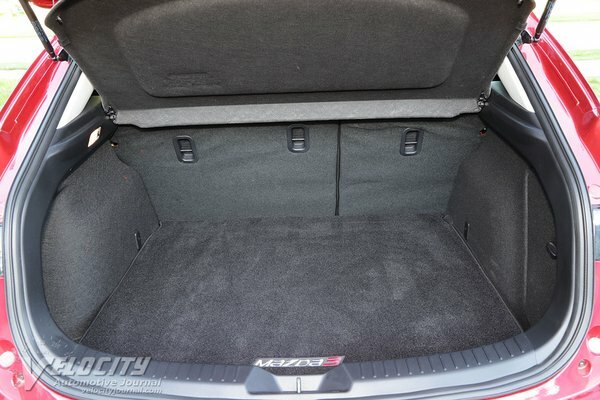 added weight of the Grand Touring vs. the Sport, the larger 2.5L is the appropriate powerplant. On startup, the long stroke four buzzes but soon settles down to a nearly silent idle. Torque output is adequate around 2,000 RPM, but fattens considerably near the 3,250 RPM torque peak. Horsepower builds linearly to the 5,700 RPM peak and then falls off rapidly as revs approach the 6,500 RPM redline. However, the long-stroke four doesn't encourage high revs, and it's unnecessary to venture past 4,000 RPM to achieve decent acceleration. 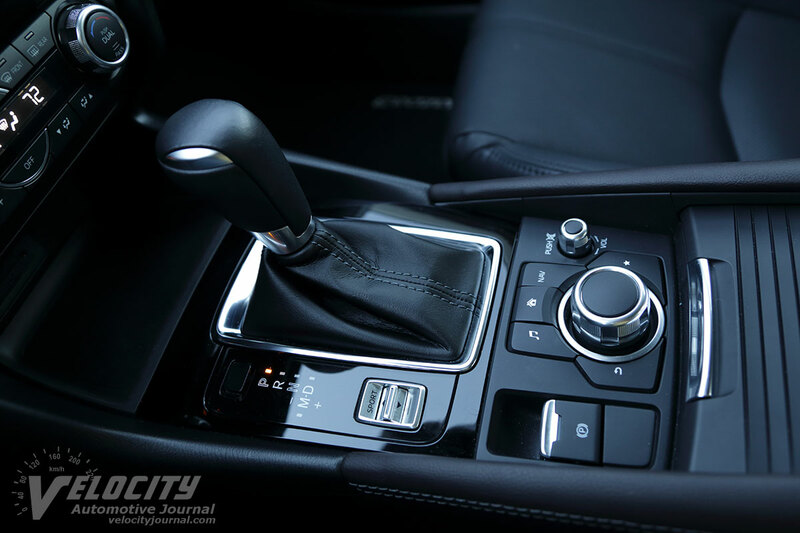 The 6-speed automatic shifts seamlessly as expected. 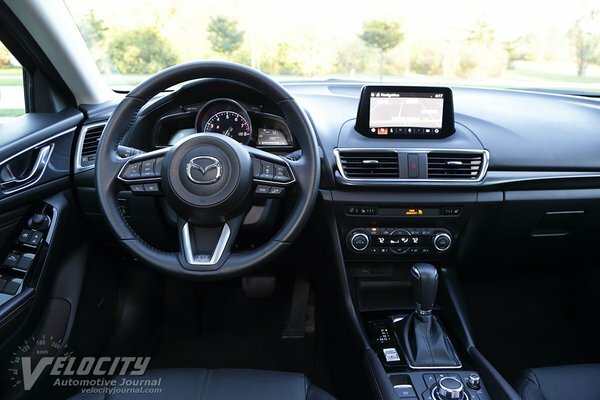 Toggling the sport mode switch on the center console alters the transmission programming to shift at higher revs and does not engage sixth gear. 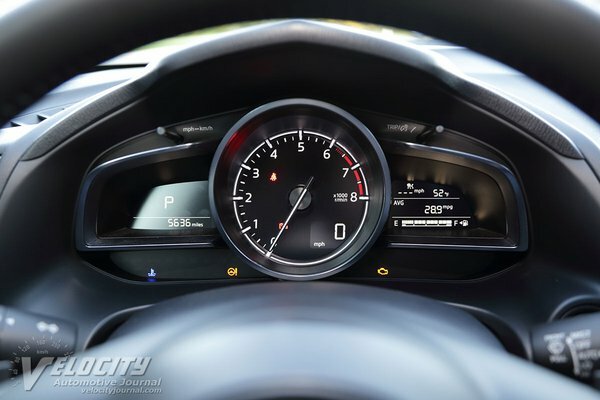 Even at full throttle, the automatic shifts below the 6,500 RPM redline. Paddles on the steering wheel allow full manual shift control whenever desired. We frequently tapped the paddles for quick downshifts to pass slower traffic. 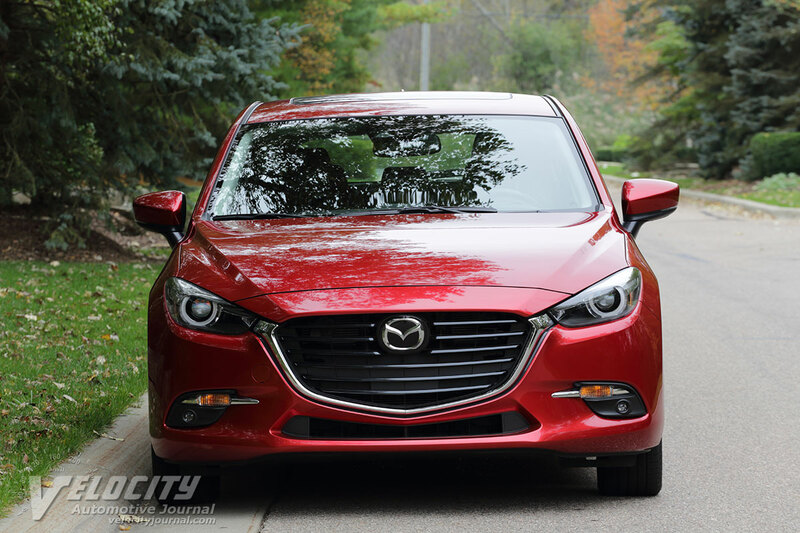 We expected sporty handling, but the Mazda3 delivered mixed results. Minimal understeer combined with moderate body roll proved to be an engaging mix, but the Dunlop SP5000 tires had unimpressive grip in both dry and wet weather. A glance at the tire sidewall showed a "B" wet traction rating, explaining its mediocre grip. Despite spring rates optimized for a compliant ride, the stiff sidewalls of the 45-series Dunlops could not absorb impacts from frost heaves and patched pavement. Customers in other regions with properly maintained roads may not notice. Braking performance is adequate, aided by a progressive pedal, but the soft spring rates resulted in noticeable dive under braking. The electrically-assisted steering is tuned for moderate effort and provide decent feedback of road surfaces. On the highway, wind noise is subdued, but significant tire hiss penetrates the passenger compartment, especially on some asphalt surfaces. The chassis handles most bumps with ease, but the previously mentioned frost heaves tend to upset directional stability. 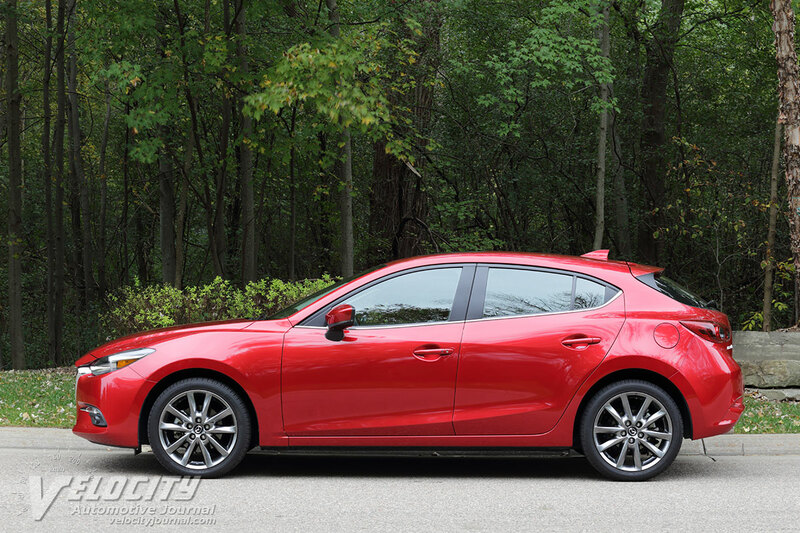 Mazda has marketed itself as a driver-oriented brand, so it would be disappointing to report that the Mazda3 is not aimed at enthusiasts. 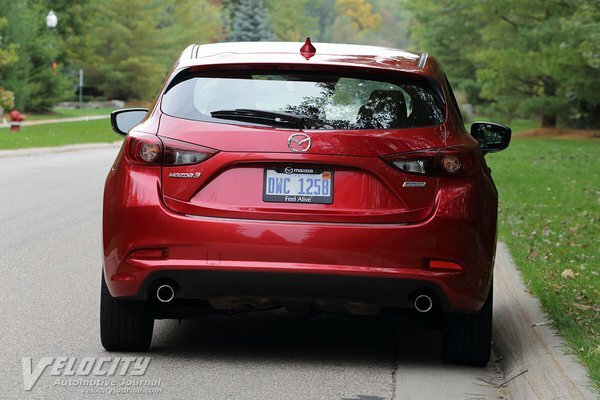 Fortunately, this is not the case, as the Mazda3 has most of the details right. 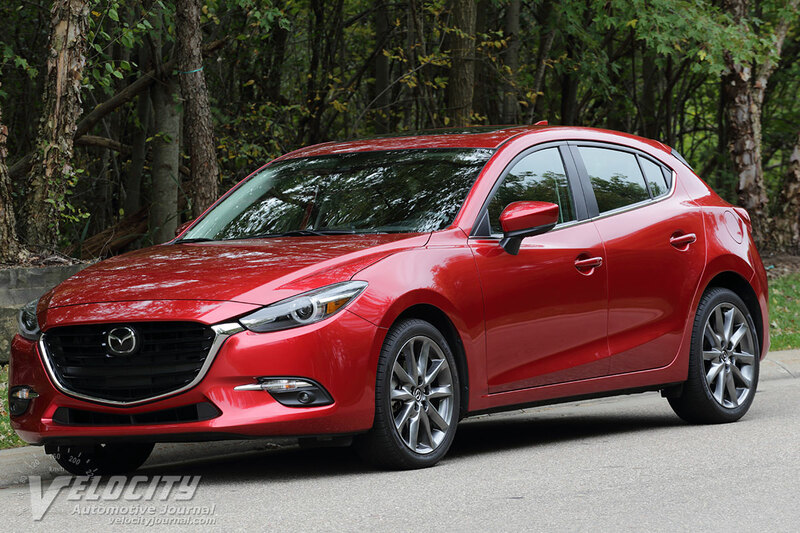 The most significant issue with the Mazda3s Grand Touring is its pricing, which nears the upper limit for mainstream compact cars. 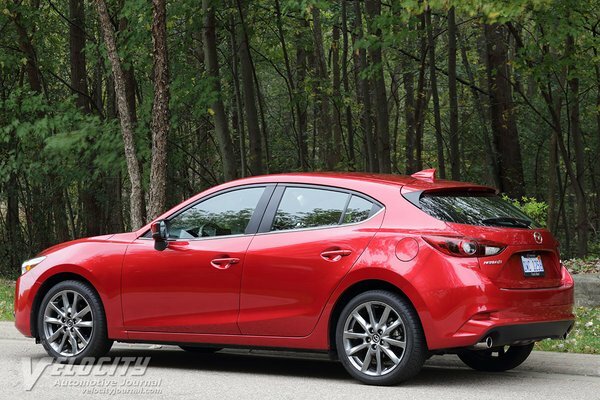 We think that most customers should consider the less expensive Sport or Touring models as a superior value.